Lee Zin-mi really is a sweet little girl, but that is about the only true thing about the propaganda film she was supposed to star in. Russian filmmaker Vitaly Mansky was supposed to make it, because he would have given it international credibility. However, unlike other disgracefully compliant filmmakers allowed inside the notoriously closed state, he quickly and repeatedly clashed with his minders. Mansky duly followed the ground-rules requiring him to allow the authorities to review his footage each night, but digital is a subversive format. Unbeknownst to them, Mansky’s camera was not simply recording between “action” and “cut.” He also captured the minders as they staged the phony propaganda. 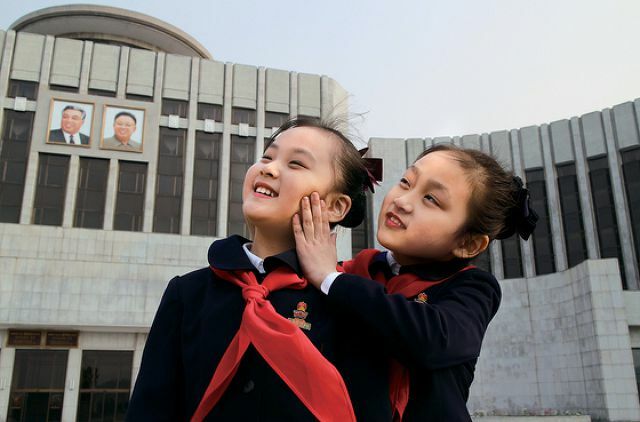 Viewers get a rare chance to peak behind the curtain of DPRK rhetoric to see the enforcers threatening little girls to look “joyous” or else in Mansky’s Under the Sun (trailer here), which opens this Wednesday in New York. Wherever little Lee goes, there is always someone there to lecture her (and us) on the glories of the Kim Royal Dynasty. As she prepares for her initiation into the Children’s Union, her family will live in a fake apartment (nice, but not spectacular by most nations’ standards) and actually eat regular meals. Her father starts the film as a journalist, but he then becomes the engineer at a garment factory. We get to see him celebrate with the joyful workers when their latest productivity results are announced, but with each successive take, the minders keep increasing their quota-busting percentages. Under the Sun starts slow, allowing us to get to know Lee and her family. However, when Mansky and editor Andrej Paperny let the first apparatchik peak into the frame, the film takes a seriously sinister turn. We then watch as Lee’s pageant dance instructor reduces her to tears. Of course, the command to “look happy” always remains in full force. Even when they are faking it, everyone looks miserable in North Korea. This is especially true of the everyday crowd footage Mansky presumably captured surreptitiously. Yet, what really makes the film sting are the moments when we see how much pressure young Lee is under. She is just a kid. She shouldn’t have the full weight of the Kim family dictatorship weighing down on her. However, if Mansky had ignored this terrible reality, it would only make matters worse. 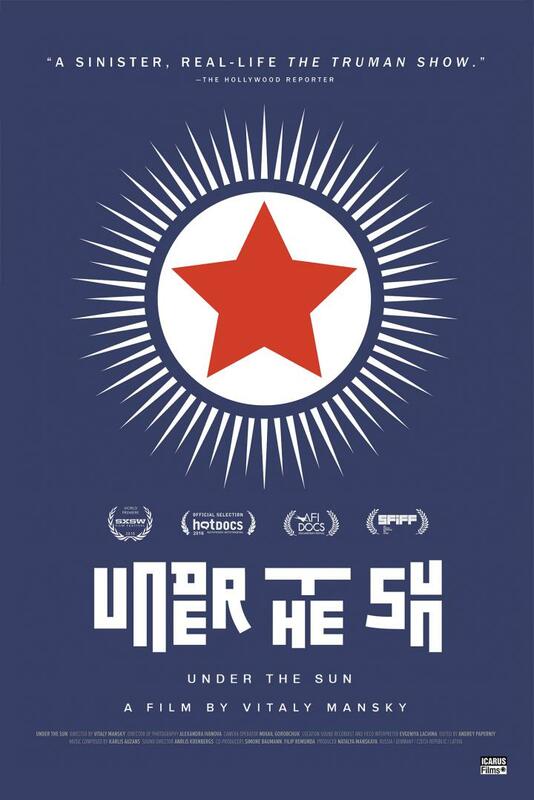 Needless to say, Under the Sun has provoked outrage from North Korean authorities, as well as Putin’s Ministry of Culture, which thought it was co-financing a very different film. Perhaps most disappointing was the revelation a MoMA curator axed Under the Sun from this year’s Documentary Fortnight, for fear of offending North Korea. That led to a mini-firestorm and her apparent dismissal. If that is indeed how things went down, MoMA deserves credit. For too long and too often, submitting to censorship demands at the expense of our freedoms has been seen as the safe choice. At least in this case, there were professional costs for betraying the values of free expression all film curators should necessarily share. Be that as it may, Under the Sun is a fascinating film, but it could have used Mansky’s voice to more fully explain what was happening just outside our field of vision. We can see enough to fully understand the gist of the situation, but there must have been even greater lunacy they tried to hide from the mostly Russian crew. Still, there is an unvarnished, un-spun integrity to the film as it is. The world cinema community has a dual responsibility in this case. We should all see Under the Sun and take stock of the ways Mansky circumvented his minders. (Australian filmmaker Anna Broinowski should hang her head in shame, because Under the Sun truly exposes how cravenly subservient she was while making the gutless puff piece, Aim High in Creation.) Going forward, the international film world also should do its best to keep tabs on Lee and her family. The regime should be made to understand if anything happens to the Lees, it will reflect disgrace on them. Very highly recommended, Under the Sun opens this Wednesday (7/6) in New York, at Film Forum.